Orthodox Church liturgical Clergy stikharions (albs) (yellow-gold) by Istok Church Supplies Corp.
For revered Orthodox Christian clergy members, we proudly present an extensive range of high quality yellow-gold clergy stikharions at unbeatable prices. 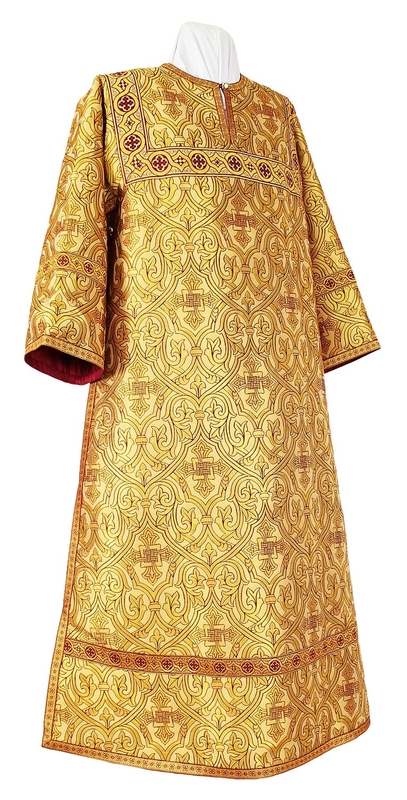 We are committed to upholding the unique traditions of the Orthodox Christian faith and our collection of clergy vestments including stikharions reflect this. Holding a clergy post is a divine calling and a matter of great pride. 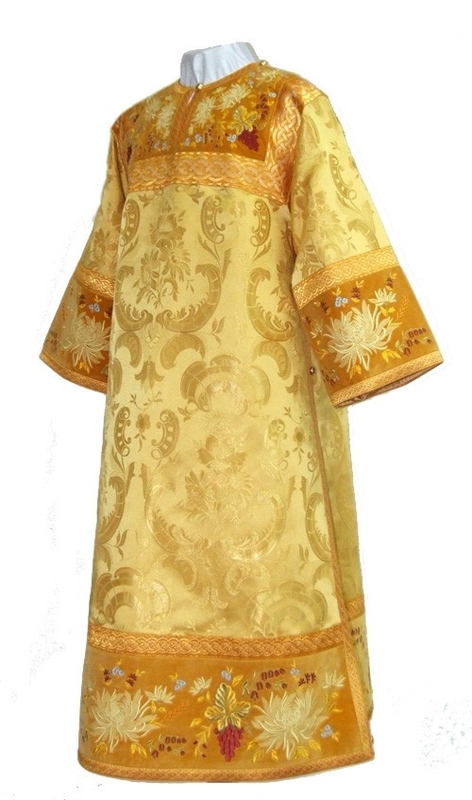 To help members carry out liturgical services with confidence and devotion, we offer yellow-gold clergy stikharions in best-value liturgical fabrics such as rayon brocade, metallic brocade and natural German velvet. From elegant plain and floral motif designs to fascinatingly intricate Christian themed patterns, our liturgical fabrics supplied by trusted vendors come in myriad styles. Our yellow-gold clergy stikharions are perfect for all liturgical seasons but have special significance when worn for Sunday services and for commemorating Holy Apostles and Hierarchs. Every clergy stikharion is fully lined with natural rayon for added comfort and longevity. Customers can upgrade orders with natural velvet inserts or select from two premium decoration types. Standard decoration (free of cost) includes plain crosses and inexpensive galloons but customers who want extravagant stikharions can select either premier type or luxury type decoration. We provide made-to-measure services free of cost and offer shipping to customers across many continents including Europe, North America and Australia. We have a production facility in Europe where some of the best ecclesiastical tailors work on putting together custom-tailored clergy stikharions with great workmanship and attention to detail. While we strive to deliver orders in the quickest time frame possible, we request your patience as each order is a labor of love and service to God for us and we don’t settle for anything less than the best results. Our mission is not just to sell products but to propagate the Orthodox Christian faith and ensure complete customer satisfaction. We hope you enjoy our website browsing experience, easy ordering process and secure payment solutions! I received the Karona cloth; magnificent, and thank you.